Kite Craft - It`s a Breeze! Flying a kite is a sure winner. Getting the kids involved in hands on kite craft is where the excitement starts. The best kids crafts to begin with should be the easiest ones. There is nothing worse than children becoming impatient because the end product is not in site quick enough. So keep it simple at first! Later I will introduce you to more advanced kites but not too difficult. The simplest paper kite we could think of to make was based on an A4 sized piece of paper. The end result worked a treat with the Iain and James a few years ago. We had long hours of enjoyment from the easiest of constructions, which only took about 1 hour to make from scratch to the finished product. All the components for this project can be found around the home and there are no skills needed to get it to lift off the ground. 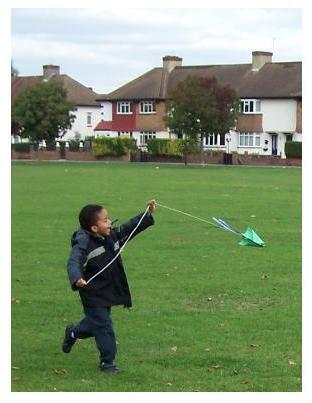 Flying a kite is a calming pastime for kids and a very social one. If you know of any kite festival taking place this year near you, make it a date to take the kids so they can see all the different kite craft that litter the skies. The displays are stunning. You are helping to ignite the creativity in them for this activity. There are quite a few simple wind toys you can get children to build for windy days. Try engaging them in making a pinwheel. The younger ones love them. If their little hands find them too hard to construct, they can decorate and someone older ones put them together. While we are still on the subject of small and easy kite craft, pocket kites are also a favorite. Some people refer to them as pocket sleds. 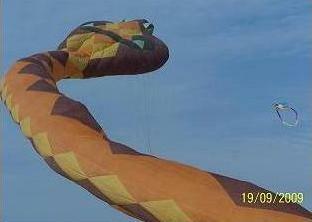 You will see them bobbing about in the sky at most big kite festivals. Look for the makeshift workshops set up for the day where the kids can have a go at building and coloring their own. They are simple to cut out, and sleds are one of the best flyers around. Bigger sleds are what haul the giant inflatable kites high into the sky. This snake on the right is one of Iain`s favorites that we saw being pulled up by a large sled at Margate Kite Festival, England. 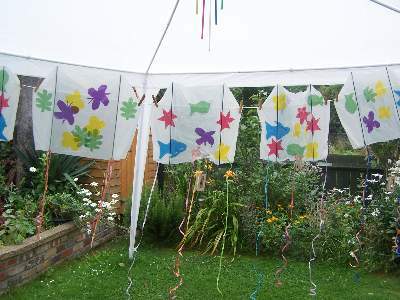 Like the pinwheels, or windmills as we call them here is England, there are other kite crafts that children can admire and enjoy right at home in the back garden. Keep them occupied with making wind socks or wind chimes which have an endless variety of themes to choose from. Wind socks are colorful and can be made from either polythene, or kite fabric. Let the kids ideas run. Bees, butterflies, fish like the Japanese koinobori, snakessssss! As for wind chimes, save old cds, large buttons, beads or tin cans. Anything that makes some kind of interesting sound will do. Use your imagination! Have you heard of a tetrahedron kite? We are getting into the symmetrical here. These are for the older kids to make, and it will take a few days to complete the project. They are much harder to fly, taking a bit of skill but they do look koooool. All you need is a few drinking straws, string and tissue paper and you`re all set for some fun. If that sounds a bit complicated, the classic diamond might appeal to your construction crew. You can build them out of so many different materials like wrapping paper, polythene bags, newspaper, calico, and rip stop nylon. You can even make them out of your Sunday-best shirt according to Maxwell Eden who wrote "The Magnificent Book of Kites". I`m curious! Do kids know what a Sunday-best shirt is? Maybe not! A few days out of the holidays can be spent on any of these kite craft ideas. One or two days spent making them and one to enjoy the flying. So get the diary out and start planning! You don`t need to spend a packet on entertainment for children. 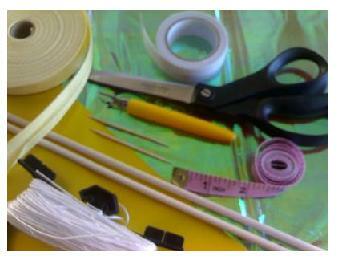 Kite craft materials are inexpensive and can be bought locally. There are different types of craft paper that can be used depending on which kind of paper kite you are going to make. You can make the kind of kite you see in my pictures, or make small diamond kites from tissue paper and thin dowels or bamboo sticks. 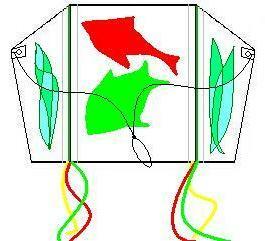 Buy light materials to build kites, and decorate them. Feathers are nice and light and plastic sequins are also feather light. Felt tips or markers are best for bold colored decoration, and paper streamers, or thin strips of polythene for kite tails. 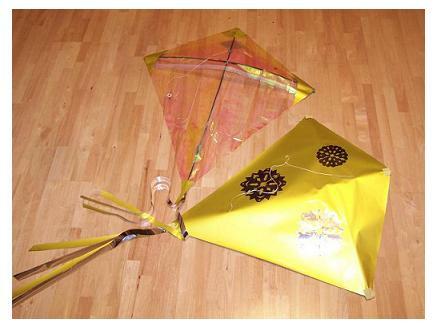 Use a strong thread or very fine string for simple paper kites, and they will fly better. There are other alternative paper crafts that you can try. After your children see their creations come to life they will be won over. It`s not always a perfect day for kite flying. In fact, it`s either too windy or too still. You just have to wait and see what the wind is doing. Kite coloring pages can come to the rescue and keep us from being totally disappointed. We have some nice kite pages to color. Why not have a look. What can I do it`s a breezy day? Sitting at home, sitting all day. Watching the leaves dance and play. Watching the trees bend and sway. Watching that kite up in the sky. Look at it fly! Look at it fly! Where`s my kite? I`m longing to try. Let the line out, and fly it on high. Free as a bird, frolicking light. If I just could, I`d fly it all night. Beautiful colors, vibrant and bright. Why did I ever forget my kite? These sled kites below were made by the kids at the KKC Summer Workshop.